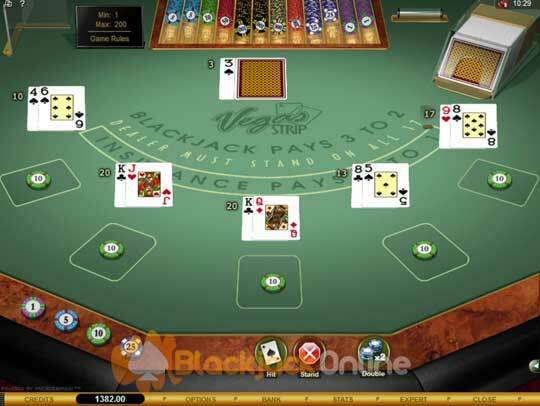 Vegas Strip Blackjack can be found in the gaming suite of all Microgaming software powered casinos, boasting a fairly average house edge which, when you are playing with perfect strategy works out at 0.35%. This game is of course available to play in two modes, those being the free play version or the real money variant. Microgaming powered casinos have this game on offer in either their fully downloadable suite of games or via their instant play, flash powered casino platforms. 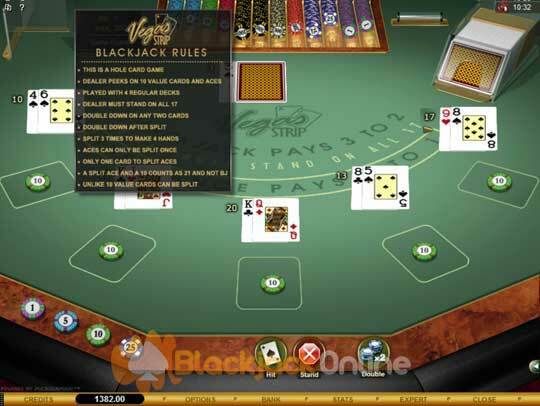 To learn how to play Vegas Strip Blackjack perfectly then make sure you download our Vegas Strip Blackjack Strategy Card (see below) which shows you how to play in the best strategic fashion, when facing any dealers up card with any hand you have been dealt. Playing a Pair of Seven’s - Always split a pair of seven’s, unless you can see a 8 to Ace valued card as the dealer up facing card, if so then you need to hit that pair of sevens. Splitting a Pair of Two’s - Unless the dealer has a 8 to Ace card showing then you should split a pair of two’s, if he is showing any of those cards (8 to Aces) then you need to hit your pair of two’s, this is the correct way to play any pair of two’s, so never deviate from playing perfect strategy or it will end up costing your dear, and will increase the house edge you are playing against! Doubling Down on Hard Elevens - When you have a hard eleven hand then this calls for you to always double down such a hand, the only time you shouldn’t is when the dealer is showing an Ace, if he is then hit your hard eleven. How To Play a Soft 20 - There is only one way you should play a soft 20 hand, and no matter what the dealer is showing you should always stand such hands. Dealer Rules - The dealer has to stand his hand whenever he has a value of 17 or higher. He deals this Vegas Strip Blackjack game from a shoe which contains 4 decks, all of which are shuffled before any new game starts. Whenever the dealer has been dealt a ten or an Ace, he will peek at his other card, which, being a hole card game is dealt face down. Player Rules - Any two cards you have been dealt may be double downed on, and when you have split cards which can be any pair including unalike ten valued cards, you can double down on those also. Players may split all pairs and as mentioned unalike ten valued cards, Aces will only be allowed to be split once, and one card only is dealt to them both. Payouts - You will be paid 2 to 1 for a winning Insurance wager, 3 to 2 for a winning Blackjack hand, and all other winning hands which include split Aces that have been dealt a ten valued card, will be paid out at odds of even money.